The fundamental purpose of the Forensic Mental Health Services Directorate is to provide local, high quality, specialised and comprehensive mental health and learning disability service for offenders with mental health needs and others who may benefit from it. These services will strive to enable individuals to take responsibility (as far as they are able) to improve their own health and well being and to minimise the risk they may pose. 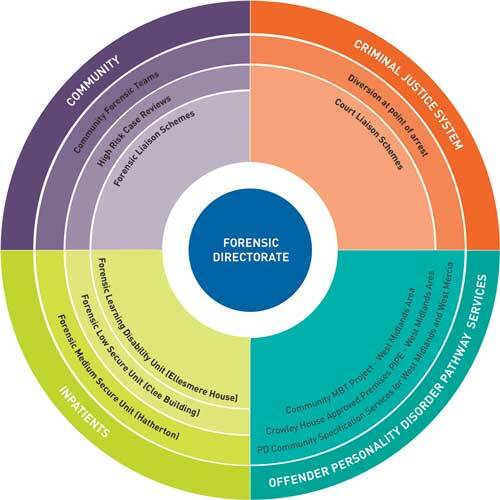 The Forensic Directorate provides a range of services spanning the forensic pathway. This includes the Criminal Justice Mental Health Services which provides a liaison and diversion service to local courts and Police station, Community Forensic Liaison Services and Personality Disorder Psychological support to Probation Services in West Mercia and Staffordshire in addition to a male inpatient service which spans three secure facilities within conditions of both medium and low security. Our Forensic Mental Health Service operates three inpatient facilities. The involvement of Family, Friends and Carers is incredibly important for service users who are in-patients in our Secure settings.